The world of music is an extraordinarily large place. It is populated by talented individuals who, as musicians, come from faraway places - like Ouidah, Benin, or Hamamatsu, Japan. They develop their musical voices in many more places, like Paris and NYC, or Tokyo and Boston, absorbing influences and integrating cultures along the way. Through their travels, growth, and performances, they become citizens of the world, and they bring their music with them. But much can also be said for letting the world come to you. Certainly the world of music. Two women of the world bring their signature musical perspectives to Seattle in the coming weeks, as Angelique Kidjo (May 4-6) and Hiromi (May 8-9) each make return visits to Jazz Alley. 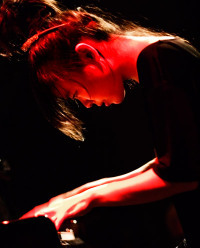 Hiromi first landed in the Bent in March of 2006 (read what Ahmad Jamal and Oscar Peterson had to say about her) and has been a frequent visitor to my headphones ever since. The best way to describe her music, is to let her. "Other people can put a name on what I do. It's just the union of what I've been listening to and what I've been learning. It has some elements of classical music, it has some rock, it has some jazz, but I don't want to give it a name." I'm with her. Other people can try. Not me. But I highly recommend, given the opportunity, you sit in the same room with her and listen and watch. The experience will prepare you for her recordings, including the latest, Time Control , which features a Slovakian drummer, a British bassist, and was recorded in Nashville. Via Hamamatsu, Tokyo, Boston and the world. Kidjo, who was born in Benin, began performing when she was six years old and has been evolving her West African-based celebratory dance music for the last 4 decades. While political upheaval lead her to Paris, she never left her traditional roots behind. Her influences are global and span decades, she has collaborated with too many names to drop, and serves as a Goodwill Ambassador for UNICEF. Djin Djin , her just-released CD features Alicia Keys, Peter Gabriel, Josh Groban, Carlos Santana, Joss Stone, and Branford Marsalis. Such artists certainly help extend the considerable reach of her music, but she won't need their help to reach you at the Alley. That's a good thing, because she'll need the room on stage for you. The world, after all, is a small place. You had introduced me to these ladies before... and I can validate and verify what you say is true. I look forward to the op to sit in the same room with Hiromi and listen/watch. You photos take me almost all the way though.